Lens of Perception | taneyism! 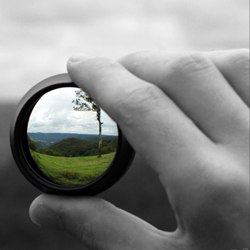 Misunderstandings, conflicts of interests, and arguments all stem from what I refer to as the “lens of perception”. Everyone in this world carries a different type of lens and it can vary by size, shape, color, and function. Some of us might use a wide angle; others might choose to zoom in. The images produced in our minds could also have varying effects, such as sepia, amber, grayscale, or black and white. The fact is, everyone is different and we perceive the world differently. The “lens of perception” is based on how a person perceives and responds to the world. It varies among different people for a variety of reasons, such as a person’s genetic makeup, attitude, personality, influences from people, and the experiences endured throughout life. In the physiological aspect, we are all equipped with different components such as our brain, heart, eyes, ears, nose, tongue, hands, and feet. The sensory components report the sights, sounds, smells, tastes, and touches to the mind, which processes it into life experiences. Our most brilliant thoughts and deepest feelings are essentially just depictions of our mind. For example, imagine yourself standing on an exquisite beach out in Cancun, Mexico on a sunny day enjoying the beautiful scenery, smelling the fresh sea breeze, and deeply experiencing a sense of euphoria. Could this be what you are really feeling or just what your mind wants you to feel? The man that resides a few miles from the beach feels normal and sees nothing astonishing; just a bunch of sand and noisy waves. This is not because he’s incapable of experiencing it, but rather his mind is clouded and has different objectives. If you took the man out of his environment and put him in a desert for a few months then send him back, it is likely that he would return to have different feelings and sensations from the beach. As we can see, the mind is actually our interpreter. It receives communications from our sensory components and tells us how we should feel, instead of what is actually being felt. Unlike modern products we see on store shelves, we are precious products of nature; each created with uniqueness. Just look at it this way, given the ingredients and recipe to cook the same dish you had last night, would it be identical to the one from the restaurant? The answer is obviously, no. It might come close, but it would not be the same. As human beings, we are unique products from human creation just like cooking. Being special and unique may have its downfall as well, but that’s not always the case. Throughout adolescence, I felt as though no one understood me. Most of my family were born and raised in another country with different beliefs and morals. It was hard for them to relate to me and vice versa. Since the world is constantly evolving and changing, I think this feeling toward our parents is very common and most of us can relate. Being understood is no longer an issue because I have realized that there are so many other people out there that I personally cannot understand. Often times, people will look at our lives from their own “lens of perception” which leads to misunderstandings. Even if we switched shoes with someone else and walked a thousand miles in them, we will not fully understand them. We will always be wearing our “lens of perception” (holding on to our beliefs, experiences, and influences), but we might be open to adjust our lens accordingly. It is almost impossible to fully understand another person’s “lens of perception”. Whether we decide to analyze a painting, read a book, or admire the fireworks in the sky, we will all have varying interpretations of it. Even if we were at the same place at the same time, we will have encountered different experiences. The main point is not to understand another person’s “lens of perception”, but rather understand that it’s perfectly normal for them to perceive differently. When you become aware of this concept, you will potentially minimize conflicts and possibly resolve issues. We all share different perspectives, it’s really just different shades of reality. I have always wished that I could share my lens with other people. Whether I choose to write, draw, or act, it will be a limited presentation. Writing is based on language, which is inadequate because some things are not capable of being expressed in terms of words. Bias occurs when people attach particular experiences, feelings, and emotions to different things. In writing, the bias is the attachment to words. Drawing the picture of my mental image might be a better approach, but bias exists due to the interpretation of objects, shapes, and colors. Acting out the same experiences might seem clearer, but people will view significance in different parts than intended; just like how I described the Cancun example up above. Since the lens is inseparable, all we can do is adjust and fine tune it to provide the best experience. It’s a two-way feedback system: how we choose to see the world, will vary how we respond to it as well. By learning to shape your lens, you will involuntarily shape your reality. My life has changed drastically for the better ever since I became aware of the “lens of perception”. I am able to share my views without feeling the need to make people understand. Some people will never understand us no matter how hard we try to justify ourselves. By utilizing and becoming aware of this idea, there’s no need to waste your breath, time, and energy when the outcome is essentially the same. There are certainly times when you should be convincing and persuasive, but be aware that in certain circumstances, you should just “agree to disagree”. Thank you for letting me share my “lens of perception”! I would now like to thank Hal Zina Bennett for sharing his “lens of perception” with me in his book titled “The Lens of Perception: A User’s Guide to Higher Consciousness”. It is currently my favorite book and I recommend it to everyone! lens will evolve overtime. Personally speaking, I would like to consider myself quite idealistic and optimistic about our many stages and major experiences in life; including, education, careers, marriage, child-rearing, etc. Now, I’m a natural skeptic. Of course my circle of influences and environments definitely contributed to this feeling of skepticism, but nevertheless, it’s a miserable feeling. Is this temporary, is anyone else experiencing this? Have you seen your share of greed, desperation, and deceit? My lens have definitely shifted. Perception is everything. Perception begins and ends within. It evolves with you.